Need a little retail therapy? Look no further than your own neighbourhood. Spring is here and that means it’s garage sale season! A yard sale can be a treasure trove of goodies, so get out there and have some fun while getting some great deals. Here are a few ideas to get you started. When Saturday morning rolls around, plan to get up early. A garage (or yard) sale will typically start around 9 a.m., give or take an hour, but it’s not unusual to find bargain hunters scoping it out before then. Make the most of your time by hitting the sales early for the best selection of goods. Sure, bring the big bills for the more expensive deals, but make it easy on yourself and the seller by having lots of small bills and change ready to use. 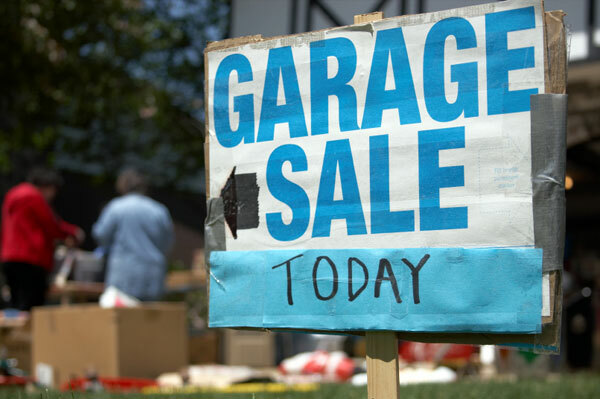 Many items in a garage sale are priced at only a dollar or two, so keep the loonies and toonies handy! Will you take a dollar for that? Don’t be afraid to negotiate a better price. Getting a great deal is not only part of the fun, it’s also expected — so put on a smile and make them a offer they can’t refuse! Let your treasure hunt begin! Here is a list of popular items you might be able to find for a great deal at a garage sale. Some items might not be such a great deal after all. Here is a list of a few things to avoid. Baby gear. It’s best to err on the side of caution and avoid purchasing anything that is potentially unsafe or not up to code. Car seats may be expired, while high chairs, motorized swings and baby gates could have been recalled. Soft items such as plush toys, comforters and pillows. You never know what could be lurking inside, and one of the last things you want to bring home is a pillow full of bedbugs! Unsealed hair and beauty products. They may be contaminated. Electrical appliances and devices. At least check them out first to ensure they are in proper working order. Check the connections and cords for fraying.